This was one of the most commonly requested features. You can now export AUTHREC definitions in MQSC format from the object and list dialogs as well as include AUTHRECs in the automatic Queue Manager export list. We are pleased to say that this version allows you to experiment with the MQCONNX, Message Handle and Message Property API calls. More information will be coming soon in another blog post. When displaying a Channel Status output, MQ will send you the IP address eg.198.51.100.34. However, this is not hugely memorable. You can now ask MO71 to issue a gethostbyaddr() and display the result in a hostname field. You can go even further and put your own description of this in a dns file, MQMON.DNS, and have MO71 display that instead. Read more about this in Displaying host names in MO71. You can define your own commands which are then available in the Queue Manager context menu. Read more about this in Running User Commands in MO71. By basing message operations on Message Tokens the message operations such as browse, copy, mode and delete are much faster and more specific. When you are browsing a message you can select ‘Edit…’ from the context menu and the MQEdit product will be started editing the same message, saving you having to re-navigate to that message in another tool. This is possible through the use of Message Tokens. You can also open the MQEdit product from a queue list and a single queue dialog and it will open with the messages from that queue already loaded into the list. Ensure you have MQEdit V9.0.1 (or higher) in order to do this. If you don’t have a licence for MQEdit, these options will not be available. Some MQ fields can now be quite large, for example topic strings, subscription names and subscription selectors. This can mean that lists of objects can be have columns which are wider than you would like. You can now say how wide the column should be by default, and a new ‘…’ indicator shows if there is more to be seen than the column is currently displaying. As above these large MQ fields can mean that the browser output is hard to read or it results in an output with a large horizontal scrollbar. You can now tell MO71 how much data to return in these situations. UPDATE: With a minor update to MO71 after the release of IBM MQ Continuous Delivery Release 9.0.2, support for Command Level 902 has been added. Read more about the new command level in What’s in Command Levels 90x. 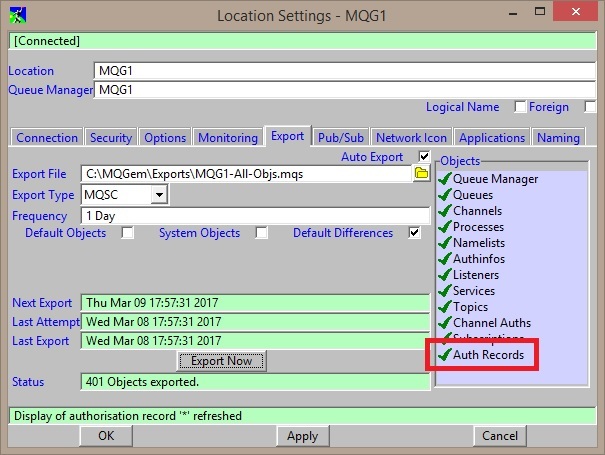 This entry was posted in MO71, MQGem News, MQGem tools and tagged AUTHREC, GUI, IBM MQ, IBM WebSphere MQ, message editing, MO71_Mar2017, monitoring, SSL, TLS, tools, WebSphere MQ by mqgem. Bookmark the permalink.